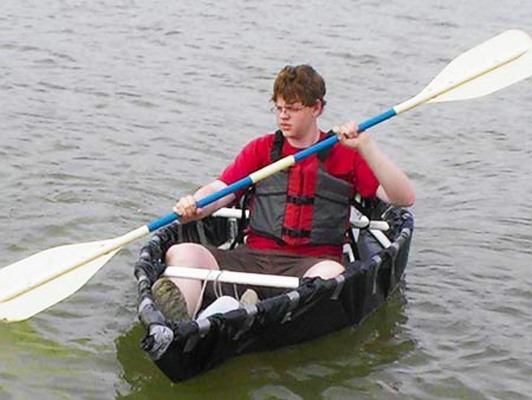 A while back, Ben Glick and his son Daniel ventured into the land of MacGyverisms when building a prototype for their more expensive wood-framed and fabric-skinned kayak. 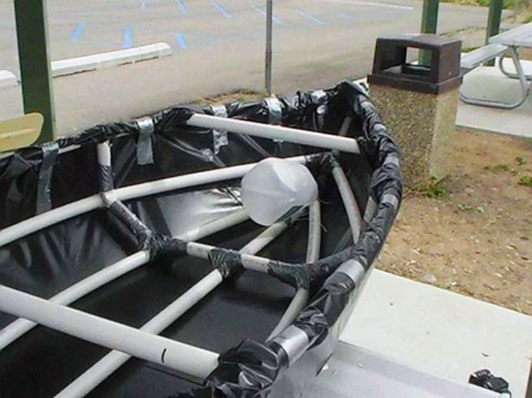 The prototype canoe is made from PVC pipe, plastic sheeting, cord, and two empty one-gallon milk jugs with lids. And let's not forget MacGyver's favorite thing—duct tape. If you've even got the slightest bit of aquaphobia in you, I wouldn't suggest trying this makeshift watercraft out. But if you're more than comfortable on the open water in a boat made of plastic, then continue on to the instructions on how to build your own at Duckworks. This homemade canoe shouldn't set you back more than 30 bucks and 5 hours. Heh, I wasn't aware this had gotten much interest! If I may, I'd like to add that after constructing this boat, my father and I made another version of this as a kayak, skinned with bed sheets and house paint. We ended up taking first place in the Rio Grande Raft Race with it in the homemade category! Wow. Cool! Would be great if you could post some pics of the new boat from the race... and if you have time, a tutorial to teach the rest of us how to make our own. Here is the Duckworks article we wrote afterwards. We took it apart for scrap a while back, so I can't give any more photos, but there are some detailed shots of the joints there. The assembly was basically the same- we just used kite strings and a drill to tie the joints together and keep the skin taut, then gave it a few coats of what paint we had handy.